Usually I write about very serious San Luis Obispo City politics — water rates, tax elections, other boring stuff. Today, dear readers, we’ll talk about goofy little things our city people do, the warp and weft of city government that gets overlooked and under-appreciated. So, here goes. The city doesn’t want you to give coins to downtown’s homeless panhandlers, those unwashed who need a buck or two to put food in their stomachs. Giving to them would be the end of downtown law, order and decorum. So, the city installed “homeless meters” where you can insert your Visa card to make “contributions.” The meters have been an awful monetary failure, garnering spare change rather than useful funds, but downtown’s decorum is intact and the city’s non-participatory generosity is on public display. So, what happens if, on the other end of the social spectrum, freshly-washed, well-dressed panhandlers beg in the city? We found out last fall when clean folks from Pismo Beach, who were raising funds to purchase a coastal hillside for open space, came to beg $50,000 from the SLO City Council. The council could barely restrain itself – they were so pleased to help – so they offered the clean folks from Pismo not a token fraction of what they asked for, nor even exactly what they asked for, but 150 percent of what they asked for, a cool $75,000. In the background were mumblings this was OK since the city’s acquisition expenditures for its own open space greenbelt are winding down now that our greenbelt has been “saved.” Of course, that’s hogwash. SLO’s designated greenbelt is 54,000 acres, of which the city has “saved” less than 7,000. The majority of SLO’s greenbelt remains unprotected and vulnerable every day to permanent loss. But hey, if you repeat nonsense enough times it becomes truth, right? With the Pismo precedent, some clean folks who like the octagon barn south of the city limits on Higuera Street recently begged for their $50,000 from the city. They want to pave a parking lot and some other stuff. Again, the council could barely restrain its excitement at financing another out-of-city project. These folks got not the $50,000 they requested, but $206,000, a cool 400+percent of their panhandling request. That’s like a beggar asking for a quarter and getting a buck. Only in this social class, $50,000 seems to be the quarter panhandlers expect. The increased generosity compared to the measly Pismo handout came courtesy of last fall’s passage of Measure G’s city sales tax. Upscale out of town panhandlers now have the message – do your begging in SLO. Panhandling laws don’t apply to you. This also shows it helps, if you’re a beggar, to be from out of town. 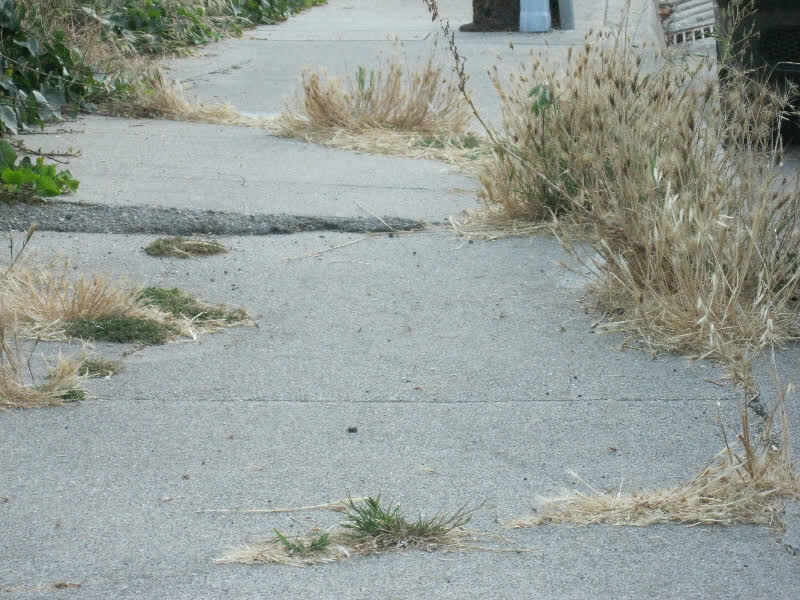 If SLO residents have pressing needs – like fixing dangerous neighborhood sidewalks or clogged storm culverts – they go to the end of the line for possible allocations from next year’s budget, and have to beg, typically year after year after year, before their needs are funded. Or more likely, never funded. Speaking of G, last fall’s ballot listed specific uses for funds generated by G. Conspicuously absent from that list were two items the council has already spent G funds on: more downtown “improvements” and new city vehicles. Downtown “improvements” means designer sidewalks and more clear-cutting of the beautiful ficus forest famous new urbanist architect Andres Duany called the best thing about downtown. Higuera between Garden and Broad was recently clear-cut, its previously cool sidewalks no longer shaded from summer sun. For years staff has tried to insinuate “downtown improvements” into the ballot-listed Measure Y (G’s predecessor) “priorities” funded each year, and has been swatted at repeatedly by resident complaints, though that hasn’t stopped the Council’s acceptance of the practice. To date the city has spent about $2.5 million on designer sidewalks for the business district, with more on the way, despite a multi-million dollar backlog of sidewalk safety fixes needed in neighborhoods. See photo for typical conditions, or just walk around town and try not to trip. Typical neighborhood sidewalk in Happy Town, except nature isn’t always allowed to become such an exuberant landscaper. City says it lacks funds to fix safety stuff like this even as it spends millions on designer sidewalks downtown. While the city’s continued use of Y/G funds for designer sidewalks downtown was more of the same, some were surprised when staff told the council to allocate $1.5 million in G funds to replace city vehicles. Turns out they’d been doing this for years with Y funds too, but the council apparently didn’t know! No matter, once staff explained although voters weren’t told they were voting for new vehicles, all was perfectly fine since staff was using the catchall category on the ballot, “to protect and maintain essential services,” to justify the expenditure. A new city initiative assigns specific coppers to specific neighborhoods, to be friends in need, somebody we can call directly with our problems. The city’s very pleased with this program, though neighborhood people tell me phone calls and emails to their assigned officers don’t get answered, and they’re better off just calling the police department, like in the old days. But that’s no matter. We now have familiar, friendly people to protect us instead of “strangers” — even if our friends are ensconced in military-like vehicles that look anything but friendly. In my neighborhood, something that needs policing is the dodos who drive on the Murray Street median, which is an unlawful thing to do. The median makes Murray a beautiful street. It used to be more beautiful with its carpet of seasonally-green turf, clumps of blooming portulaca and ice plant, and the occasional wildflower garden planted by a resident. Then, one day, all that went away, herbicided by the city’s hired mow, blow, spray and go guys. When I inquired of an expensive city hall honcho why a city park was herbicided into oblivion, he shot back that this wasn’t a park, but was “like a sound wall,” so herbiciding it was just ducky. Further, he said my concerns about spraying glyphosate repeatedly in a neighborhood full of children on surfaces that drain directly to a steelhead stream were unfounded. “It’s a safe herbicide,” he said. Right. That’s why it’s classified a carcinogen, among other things. But I digress. The subject is neighborhood coppers. To introduce us to our neighborhood officers, the city put a cute app at its website showing us pictures of our officers, and the very first picture is of my very own neighborhood’s friends in need. It’s a nice photo: a friendly officer smiling at each end of a militaristic vehicle which is parked illegally – smack dab across the Murray median. I wonder if they wrote themselves a ticket? 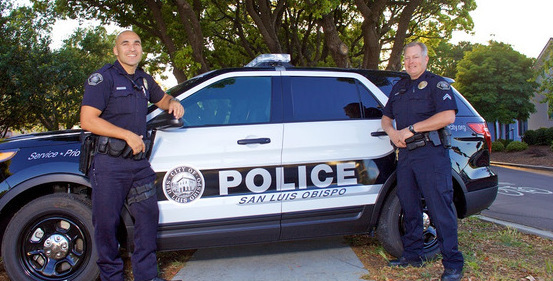 This is a neighborhood policing publicity photo on the city’s website — of officers with parked vehicle on the Murray median, which is unlawful. My head spun around a few times when I read the letter to the editor in the current SLO Journal from Mayor Jan Marx. It was a “response” to a banal comment from Councilman Dan Carpenter in a previous issue. But little of it was factual disputation or correction — it was mostly a venomous personal attack on Carpenter, an astounding compilation of name calling, ad hominem put-down, and pseudo-psychological commentary. The mayor presides over the council. One of her jobs is peace-keeping. Another is treating all members with respect. After displaying her pique in this public way, how in the world can she preside over a council that includes the one she attacked? Are there enough apologies in the world to fix this? With so many important things council minds must ponder, like how much to give to out-of-town panhandlers for their out-of-town projects, it is marvelous to observe the byways into which council minds simultaneously find time to wander. Observe where Councilman John Ashbaugh’s went in the column generously provided him by a minor print publication to discuss pressing city issues. It seems back in 1903, during his presidency, Theodore Roosevelt made a whistle stop in SLO, spending about an hour of his life in Happy Town, during which he is alleged to have made a speech on a plot where Mitchell Park now spreads (or maybe it’s Mitchell Sound Wall, for all we know). All of which has inspired Ashbaugh’s latest crusade – a campaign to raise a statue of Teddy in Mitchell Park to commemorate this momentous event which, according to Ashbaugh, was “our most recent presidential visitor.” Incredible, if true, for it would seem Reagan, who ranched a mere 80 miles down the road, never thought it worthwhile to come up to get Happy. Lacking actual presidents of the past century to commemorate, maybe we should extend statue honors to presidential and vice presidential candidates who spoke at Mitchell Park. Dr. Spock comes to mind. “Lafayette’s residents are the happiest in the United States according to a recent study by the National Bureau of Economic Research. Source: National Bureau of Economic Research, July 2014.” Woa? Hold on a minute. Who, where? That’s Lafayette, Louisiana, where a demented racist recently shot innocents in a movie theater. That brief happy statement, by the way, is all the city’s website says about being the happiest place. Do they not share our need to reassert our happiness over and over, then try to monetize it every place from our city’s website to Airbnb listings and tourist bureau PR? For Lafayette to claim our happiest title is unacceptable. We can’t share it with them. We should sue to make them stop using our brand. But that might be complicated: a Google search reveals tons of places claiming, with some third party’s assertions as justification, to be the happiest, among them recently Sarasota, Florida and five towns in Texas. It seems, in fact, both SLO and Lafayette are happiest passé, past year’s gleaming stars now gathering tarnish. Folks, we’re no longer the happiest place! I’ve always been suspicious of places and institutions that puff themselves up with dubious claims of superiority. Maybe that’s a hangover from having once, long ago, attended an awful university that puffed itself as “the Harvard of the Midwest,” apparently oblivious that Harvard is Harvard precisely because it’s not in the Midwest. Anyway, this incessant happy town puffing seems a juvenile activity, much like thumb sucking. Places with actual claims to greatness need not behave that way. Shouting “happy, happy, happy” we end up looking silly, silly, silly, and very insecure. Especially when with Google anybody can discover contrary facts — like that residents in 90 percent of U.S. cities are safer from violent crime than those in SLO. Can’t we just be pleased to be a swell place, with nice weather, and get on with it, happy or otherwise, as we individually choose, and dispense with childish posturing? Dear readers, you probably know more goofy stories than I. So how about we use the comment section, instead of for the usual grouchy stuff, as a place for you to add your favorite goofy government story? Let’s make this fun even as it’s educational. Richard Schmidt has lived in San Luis Obispo a long, long time, and still loves discovering the exuberant levels of goofiness his city can achieve. Get local news first, like CCN on Facebook. Does California have a hotel bubble? I agree, it stinks. But maybe it’s time to do something? ….speaking of sidewalks, we had perfectly good sidewalk/curb ramps ripped out and replaced with new ramps. True, the new ramps got the nifty ADA yellow braile bumps…..but with so many curbs with NO RAMPS AT ALL, why would they rip out any ramps? Many of the rampless sidewalks are near schools and other major pedestrian routes. For handicapped folks these are critical. For parents pushing strollers, kids riding scooters/bikes/skateboards, and drunk students trying to get home these sidewalk ramps are a very useful amenity. To top it off, they erected signs bragging that these were measure Y funds being used to rip up ramps to install new ramps! It’s a mess at the city hall and the Community Development Department. They are welcoming over- development, ignoring WATER, infrastructure, neighborhoods, the environment, etc. If you like the way things look and the traffic out by Costco and Target, then you’ll love the new SLO. It’s going to be ruined like other once- beautiful towns in California. The pressure is on from the developers and the city likes the money for our outrageous salaries, top-heavy administration (run by carpetbaggers) and underfunded fat pensions. How about the 9/11 memorial over by Fire Station No. 1 on Broad / South Street / Santa Barbara Ave ? I mean, they’re hiding it behind the construction fence, but it’s been going on for some time. Normally, this wouldn’t seem TOO SILLY, but my kids keep asking what the SLO Fire Department did on 9/11? Probably watched in horror as most of us did. Still, who’s going to be AGAINST guys and gals who died in another state during one terrible morning? I mean, if you think SLO building a monument to THEM is silly, why you MUST be AGAINST those brave souls, right? The town used to be a great place to live and still is if you moved her from L.A. or the Bay area. Unfortunately for life long residents the town has changed/is changing and not for the better. There are some remodeled gems, like the Granada Hotel, but there are some eyesores too! Not every development is a good idea or should be approved. The police officers used to be much friendlier; they didn’t do it because of some program, but because they lived in town. Many were local and were hired locally. I could drive down Higuera Street and wave at Pete Hubbard, Rocky Miller, Jerry Lenthall, Mike Brennler, or even Capt. Chelquist and receive a smile and a wave back. Today you wave and most often as not you receive a scowl, as if some foreign army has landed to occupy our town. Downtown used to have businesses, instead of bar after bar. Of course the rents were more in line with what they were in other small towns. The property owners had not overextended themselves by diversifying into golf courses and make believe railroads on private ranches, only to raise downtown rents to pay for their extravagances. Are your ears burning Rob Rossi? We used to have our money put into parks, streets and sidewalks so everyone, whether in car or on foot could get around town. Now we shut down streets for bike avenues, spend money on designer street art, buy double decker transit buses and give outrageous raises to city managers and the like who hardly deserve their current salaries. If this is Happy Town, you can have it. Goofy stories??? How about Cuesta?? They think they have their accreditation back?? ?and continue the usual yarn about how they care about the kids and their employees??? Ooohh it will cost you more millions than you know!!! Forgot about the few quarters you throw to a bum…they will take everything you have. I have been in SLO for 31 years. I have never lived under such Social Engineering as this City Counsel has implemented. From plastic bags to any odors depending on whose nose judges. The City Counsel needs to get that their Utopia is my Hell at every turn. Residential streets closed down increasingly more times a year for marathons/Charity Runs. And they continue to add to them. thanks for reading my mind. You people that live on those streets need to put up a front at a council meeting, I personally think that closing streets for people to run on is a crock of bull, the SLO high school,Cuesta, and I believe Poly have tracks,these people want to run,jog or bike can go to the above properties and do their thing. The give change meters are and have been not only a fraud on the public but also on the tourists. I spoke to United Way who long ago admitted the program is a 100% waste and has not funded one person or project. The sidewalks are a mess, the streets broken, cracks so dangerous you can trip and fall. No proper ability for this so called Ambassador Program is a shame, i see the same Red Shirted people picking up trash ? the cities job of which we already taxed on, the same ambassadors go to the same people day after day after day with NO positive results or help. Urination, graffiti is all over town, then you have real gang tagging and yet no one knows , who, what, why or how it is happening. I see in traffic court this Thursday a local businessman who was given a “False” ticket after the police illegally confiscated his cell phone thinking he was videotape them beating a man near 7-11 at Marsh street once they realized they screwed up they gave him a J-Walking ticket when he was not even walking. Judges told him to go to the commissioner and have the commissioner recused so he can go to a real Judge to see the false evidence from the Police. So in the 15 years of living here paying well over my share of taxes on all my properties, the city is no longer what it once was, police corruption, misconduct, county employees lying, covering things up. How would you feel if a uniformed SLO Officer began to yell, lie, make false statements, order people who are just walking on the public sidewalk to ” Get the F!!! out of here ! then make a non issue a personal issue in public all caught on someones camera phone. The city and county are in my opinion in the worst condition that 15 years ago with no end in sight for being a once lovely city. I am not sure using a talk with the United Way helps your case, it runs around .08 cents of every dollar received actually going to those in need, the other .92 cents goes to fund the organization. No wonder they don’t like anyone else getting into the “Help” business, it cuts into their funding. SLO weather forecast: Hot and sunny skies unless it clouds up and rains.